On This Day in Def Leppard History - 10th July, the following concerts and events took place. Including the ninth show of the Summer Tour 2013 tonight in Calgary which will mean they'll have played 10 times on this date. Also on this day in 1993 the live scenes were shot for the 'Two Steps Behind' promo video in Irvine, CA during the Adrenalize tour. 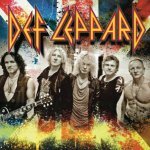 As of 2013, Def Leppard have played 10 times on this date.